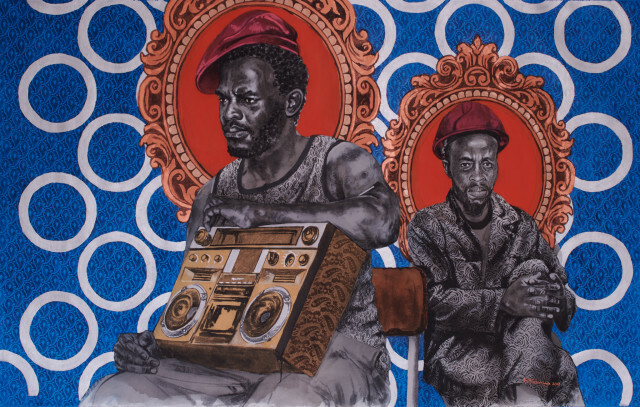 Jack Bell Gallery is pleased to present an exhibition of new paintings by Bambo Sibiya. The artist draws on traditional printmaking techniques and works with acrylic and charcoal on canvas. The title ‘Izikhali ze Mpilo’ is Zulu and translates roughly into ‘The Weapons of Life’. This will be the artist’s second solo show with the gallery. A radio played a significant role in these communities as a source of communication, a time when cell phones were not around or rather too expensive to afford. They always tuned in and listened to a program called ‘ngikhonzele’, which means please send a ‘shout out’. It was here they would come to know about the lives of their loved ones left behind. The type-writer was a means to return the news back home. There is a term ‘Ubuntu Ngabantu’ that derives from Zulu philosophy and translates roughly into ‘I am what I am because of who we all are’. Their lives were dominated by the spirit of Ubuntu.